We’ve been having lots of fun designing this custom seating chart - as well as the rest of the wedding day printing (menus, table numbers, place cards) - SO PRETTY! It all beautifully tied in their invitations, and their colour palette of purple, black & oyster. 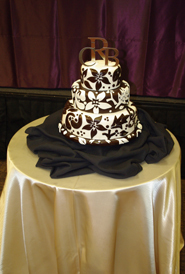 The cake was accessorized with an elegant monogram cake topper which matched the font on the invitations and aisle runner.